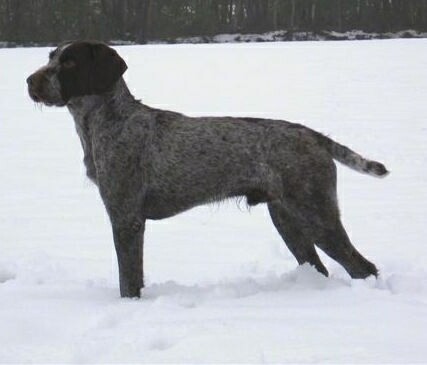 The Cesky Fousek, or Ceska Fouska for a female, is a medium-sized, wirehaired, noble pointer, whose general appearance shows strength and endurance. It is a multipurpose dog with inherent qualities for field and water, as well as for work in woodland. In spite of his innate sharpness to vermin, he is easily trained and very devoted to his mater. The lean, somewhat narrow and long head is set high on the neck. The muzzle is somewhat longer than the skull and the nasal bridge is moderately arched (Ram's nose). Skull: In the upper part of the forehead and the cranial region, moderately domed and slightly rounded, somewhat broader in males than in females. The superciliary arches are clearly defined and pronounced so that they emphasize the impression of angularity of the head and form deeper eye sockets. The occiput is barely noticeable. Stop: Moderate, yet marked toward the forehead. Nose: Broad with open, sensitive nostrils. The color of the nose leather must always be dark brown. Muzzle: Narrows moderately from eyes to nose. Lips: Fairly strongly developed; form a flexible edge to the muzzle, with the upper lip forming a moderate overlap. Jaws/Teeth: Jaws strong, clearly defined and wel- muscled. Teeth strong, with scissor bite and full complement of teeth. Eyes: The almond-shaped eyes show a kind expression and denote an astute nature. The eyes should be deep set, dark amber to deep chestnut in color. The eyelids fit close to the eye, which they enclose completely and are well developed; they are grey - black in color. Leathers: Set on high and broad, narrowing markedly towards the tips. The length of the leathers reaches to two-thirds of the cheeks and the ends of the leathers are moderately rounded. They must lie close to the head. Neck: Of medium length with well-developed muscles, yet dry and set high at the withers. The crest of the neck is moderately arched. Body: Back: The short, firm back slopes from the well-developed withers towards the croup. Loins: Short, relatively broad and moderately arched. Croup: Moderately sloping, sufficiently broad and suitably long. Chest: Together with the shoulder blade, seen from the front, the chest forms a lyre shape. The ribcage must be oval and its width in proportion to the overall build of the dog. The lower chest must reach at least to the elbow joint. The forechest should be well developed. Seen from the side, the sternum should protrude clearly. The ribcage is formed by well-sprung ribs which are arranged in good proportion throughout its entire length. Belly: Should be somewhat tucked up to facilitate free movement, yet it must not give the impression of leanness. Tail: The sacral bone must be positioned so that the musculature does not influence the tail carriage, which should be horizontal or only very slightly upwards. Set-on should form a continuation of the topline. It is medium strong and docked by 3/5 of its length. Forequarters:: Shoulders: The shoulder blade is distinguished by well-developed muscles. The shoulder placement should be really sloping and form a blunt angle with the upper arm. Elbow: Must be firmly made and muscled. Forearm: Upright and straight with pronounced, dry muscles. Pastern: Should be relatively short, almost vertical and only moderately sloping towards the front. Forefeet: Compact; they have the shape of a blunt spoon, with well-arched, tight toes and strong nails of dark grey to black color. The pads are thick and coarse and fully pigmented. There is a noticeable atrophied remnant of webbing between the toes. Hindquarters: Pelvis: Must be sufficiently long. Upper thigh: Broad, with well-developed muscles. Lower thigh: Slopes backwards; must have correct angulation to enable flexible movement. Hock joint: Not too high set, lean, with a long only moderately protruding heel bone. Rear pastern: Almost vertical, short and adequately strong. Hind feet: The same shape as the front feet. Dewclaws are removed. Gait / Movement: Movement should be completely regular at walk and trot with the backline showing barely any deflection and the footprints virtually covering each other at the trot. Makeup of coat: The coat consists of three types of hair:• Undercoat: Soft and dense, 1.5 cm long. Prevents dampness penetrating to the skin and is almost completely shed in the summer.• Topcoat: 3 to 4 cm long, suitably harsh and coarse. Close fitting. • Guard hair: 5 to 7 cm long, especially harsh and straight. Particularly noticeable on forechest, topline, flanks and shoulders. On the front part of the front and hind legs, the coat is shorter and coarse; it is longer on their rear side, forming feathering. The tail must not have a brush on the underside. Coat on head: On lower jaw as well as on lips, the hair is longer and softer, forming the beard, typical on this breed. The hair on the eyebrows points obliquely and noticeably upwards. The forehead, cranial region and cheeks are covered by short, coarse hair. Leathers are covered by short, softer, smooth hair. Color: Permitted colors are dark roan with or without brown patches. • Brown with ticked markings on forechest and lower part of the limbs. • Brown without any markings. The Cesky Fousek is very energetic, smart and willing to please. Cheerful and friendly, he likes children. Loyal and protective, he loves all family members equally, especially if they are carrying the leash, car key, gun or Frisbee. They are very people-oriented, and not happy if isolated from the family. If exercised sufficiently once or twice a day and given calm, but firm, confident and consistent authority, the Cesky Fousek makes a very agreeable family companion. If left to his own devices for long periods without exercise or leadership, he can become destructive and nervous. If raised with other dogs and cats from puppyhood, the Cesky Fousek does quite well. 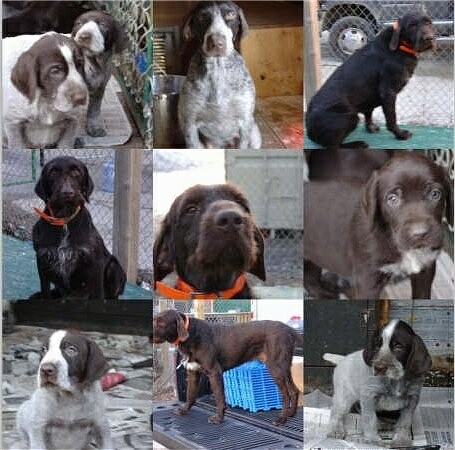 A hunting dog by nature, they are bred and trained to work in the field, forest and water. This breed has a natural keen hunting instinct to go on point, stretching his body long, taking in the scents. These are noble and gentle, easy to train dogs. They have all the qualities one could wish for in a hunting partner and 700 years of breeding to back them up. This breed likes to bark and needs to be told enough is enough if it becomes a nuisance. Socialize them well to prevent them from becoming reserved with strangers. This breed is not recommended for apartment life and does best with a large yard and an athletic family. At least a 6-foot high fence is necessary. Bored Cesky Fouseks can become escape artists. Does well in most climates. Exercise is of paramount importance for these tireless energetic animals. They are more than a match for even the most active family and they should not be taken on as family pets unless they can be guaranteed plenty of vigorous exercise. They would be great for the person who hikes or jogs. On days they are not taken for a hike or a jog, they need a daily, long walk. When walking or jogging be sure to make the dog heel beside or behind the person holding the lead, as in a dog's mind the leader leads the way, and that leader needs to be the humans. If under-exercised, this breed can become restless and destructive. The coat of the Cesky Fousek is very easy to groom. Just brush regularly with a firm bristle brush and bathe only when necessary. A rub with a piece of toweling or chamois will leave the coat gleaming. Check the feet also, especially after the dog has been exercising or working. Dry the dog thoroughly after hunting to prevent chilling. Examine the ears regularly. This breed is an average shedder. Formerly from Czechoslovakia, now the Czech Republic, the Cesky Fousek was the most widely kept wirehaired Pointing dog in the region of the present day Czech and Slovakian Republics in the time before the first World War. This World War and its consequences were responsible for the Cesky Fousek nearly dying out in the Twenties. The regeneration of the breed was implemented. The foundation for this regeneration was brought about by some of the original typical specimen from which the modern type of Cesky Fousek was evolved by planned breeding. At present its numbers are in second place for all hunting breeds used in the Czech and Slovakian Republics. 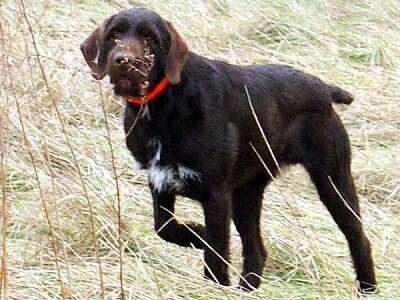 The Cesky Fousek is a gundog belonging to the family of wirehaired pointers of Continental Europe.